A transition is an element of a state machine that connects two vertices. Transitions are triggered by events. A transitions belongs to a state machine. A transition is shown as an arrow that connects two vertices. The transitions in the example above are each triggered by a completion event. A transition always has a source vertex and a target vertex. The source vertex is active. The guard was evaluated to true. The ID of the current event matches one of the transition's triggers. A transition can be part of a compound transition. 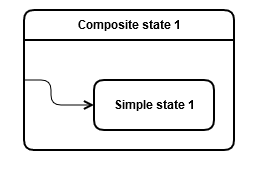 A compound transition takes a state machine from an active state configuration to another and represents the response of the state machine to an event. The default kind of a transition is external. A transition that enters a pseudostate must be an external transition. The local transition doesn't exit the source state. The source and the target of the local transition must be in an ancestor relationship. The do behavior of the transition is executed. The enter behavior of 'Simple state 1' is executed. The do behavior of 'Simple state 1' is executed. An internal transition has the same state as the source and target. The internal transition doesn't exit and re-enter the state in which is defined. This means that the entry and exit behaviors are not executed. An external transition causes the exiting of the source vertex. The exit behavior of 'Simple state 1' is executed. 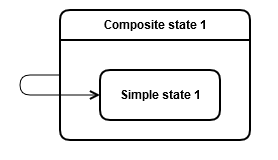 The exit behavior of 'Composite state 1' is executed. The enter behavior of 'Simple state 2' is executed. The do behavior of 'Simple state 2' is executed. The enter behavior of 'Composite state 1' is executed. There is no interpretation of and deviation from the UML specification for a state machine's transition.